Why hold your next convention, meeting and incentive programs in Hawai'i? Hawaii'i is a good choice for many reasons, the wonderful weather all year round, the magnificent beauty of our islands of paradise, combined with the Aloha Spirit make it an ideal location. There are also many activities that will meet the needs of your guests, from exploring the natural beauty of the islands, taking a surf lesson in Waikiki or visiting the cultural landmarks such as Iolani Palace, Punchbowl National Cemetary and of course Pearl Harbor. There is also world-class shopping from Ala Moana Shopping Center, the Royal Hawaiian Center newly renovated in Waikiki and also Luxury Row which features such well-known brands as Tiffany and Chanel. A respected name provides peace of mind and confidence in your selection. Hilton Hawaiian Village has received numerous awards and has earned a reputation as a highly prestigious and productive resort to host corporate and association meetings, conventions and truly rewarding incentive functions. Extensive flexibility of meeting space and guest rooms offers more options. We feature three independent conference centers - the Mid-Pacific Conference Center, the Tapa Conference Center and the Kalia Executive Conference Center, all within seven minutes' walking distance of the Hawaii Convention Center. Of all the resorts and hotels in Hawaii, Hilton Hawaiian Village has the most space devoted to group use. With the largest overall guest room inventory in a single Hawaii resort, they offer the largest committable block of guest rooms to groups (1,700 rooms), allowing them to accommodate groups of almost any size. Hilton Hawaiian Village also features a variety of room categories and pricing to meet most budgets. 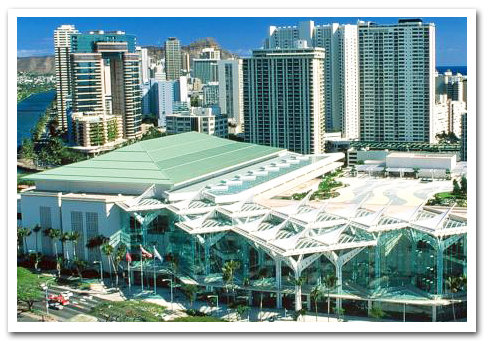 The Hawaii Convention Center, built at a cost of $350 million, establishes Hawaii's role in the worldwide business community. A natural gateway between the largest economies of East and West, it is the ideal location for meetings and conventions with a global focus. Hawai'i is the only state in the U.S. where business can be conducted with New York, Tokyo, Hong Kong and Singapore in the same day. The Center is truly a reflection of the spirit of the Hawaiian Islands. Respected historians and Center architects worked closely together to achieve a Hawaiian sense of place.